Intel has charted its course for 2019. Heres how that might impact Apple’s computers. The future of the Mac might be Apple-designed CPUs, but the present of the Mac is Intel. Apple is increasingly in charge of its own destiny, adding features like the T2 chip to Macs to handle as much of the system’s security, encryption, and other miscellaneous tasks as it can. Still, we expect Apple to ship most or all of its laptops and desktops this year with Intel inside. The chip giant hasn’t yet announced the specific processors it will ship this year, but it has delivered a few sneak peaks at its roadmap. Here’s what we know about what Intel is cooking up for 2019, and how it might impact the Mac. Intel keeps producing new consumer processors every year, but the fundamental microarchitecture upon which they are built hasn’t changed since 2015’s Skylake. This year, Skylake will finally get a successor in Sunny Cove. 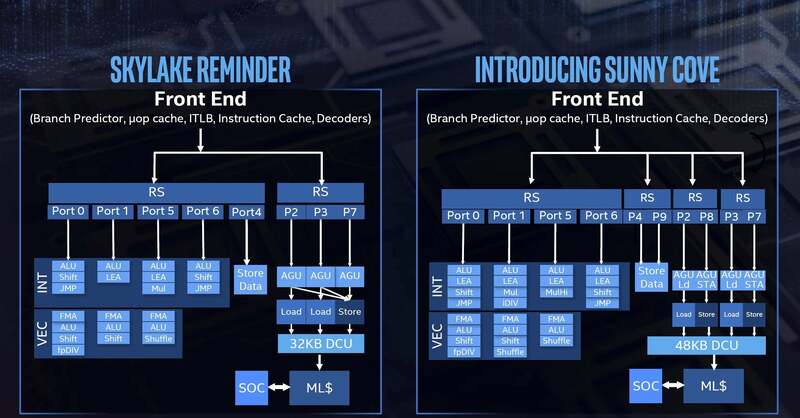 The upcoming Sunnycove cores are "wider, deeper, and faster." The new architecture is meant to offer a significant increase in single-thread performance, with bigger caches, wider execution units, and a set of new instructions meant to speed up cryptography, AI, and machine learning. Sunny Cove will first appear in a family of processors known as Ice Lake. They will be 10nm CPUs across a range of performance and power requirements, so we can probably expect to see them in MacBooks of all stripes, the Mac mini, and iMacs. The Sunny Cove cores will feature the first major changes to an Intel x86 core since Skylake CPUs were introduced in 2015. Ice Lake brings with it a number of interesting features. First is 11th-generation integrated graphics, with up to 64 execution units. The fastest Intel integrated graphics in Macs today is the Iris Plus 655 GPU with 48 execution units—Ice Lake has up to 50 percent more, along with a handful of efficiency improvements. Intel says it will offer up to a teraflop of graphics performance, which is a big step up from Intel’s current graphics offerings, but far behind the Vega Pro 16 (2.4 TFlops) or even the Radeon Pro 560X (2.0 TFlops) that you can get in 15-inch MacBook Pros today. It will also support Adaptive Sync on external displays. A new Gen 11 graphics core in the upcoming Sunnycove-based CPUs will hit 1 teraflop of performance and offer 30 percent better H.265 encoding performance too. Ice Lake integrates Wi-Fi 6 (also known as 802.11ax), so you’ll get that gigabit-class Wi-Fi speed when you finally upgrade your router. It also integrates the Thunderbolt 3 controller, which means Apple won’t have to rely on a separate Thunderbolt 3 controller. That reduces costs and motherboard complexity for Apple, but won’t make a big difference from a user’s perspective. When Ice Lake-based Macs ship, we’ll get better overall performance and performance per watt, much faster integrated graphics on the Macs that don’t have discrete GPUs, and faster Wi-Fi. Systems based on Ice Lake are promised to deliver improved battery life, but there are so many other parts of a system that influence battery life that we can’t make any assumptions there. Where the CPU uses less power, perhaps Apple will use more with faster RAM or a brighter display, for instance. In particular, the ultra-low power Y series chips are said to be considerably faster, so we’ll probably get a big performance boost on the MacBook and MacBook Air. Intel says that systems with Ice Lake processors are not expected until near the end of 2019, which means any MacBook that incorporates them will probably miss a summer release. Desktop and workstation processors using the Sunny Cove core are not expected until 2020, so they’ll miss this year’s Macs entirely. Intel launched its flagship consumer desktop processor, the Core i9-9900K, late last year. That’s going to be its premium desktop offering all year long, so any update to the iMac will probably use the 8th or 9th-generation Core processors based on Coffee Lake, as Windows PCs have been for a little while now. They’ll be faster than the Kaby Lake-based processors in iMacs today, but not leaps ahead. What is coming this year is Cascade Lake-X, the update for Xeon products. It is still based on a 14nm manufacturing process and doesn’t feature huge architectural changes, but it may offer more cores and threads than the 18-core, 36-thread Xeon W-2190B in top-of-the-line iMac Pros today. Even at the same core counts, it should offer slightly better performance and power use. Cascade Lake-X is the chip we’re likely to find in the new Mac Pro if it launches this year, along with any update to the iMac Pro. 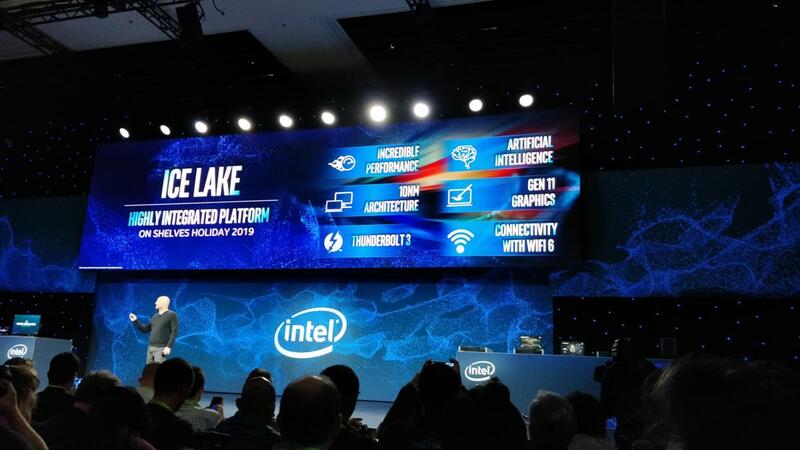 Intel hasn’t given exact specs or a release date for Cascade Lake-X Xeon chips yet, but they’re expected in the second half of this year. Intel’s got more irons in the fire than just the Sunny Cove core, Ice Lake CPUs, and 11th-generation GPUs. 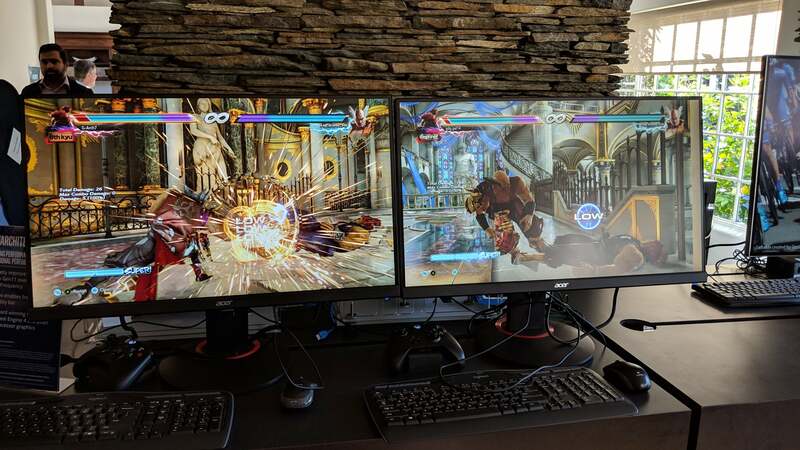 There’s also Project Athena, a nebulous-sounding industry-wide initiative to bring a certainly level of quality to super thin-and-light PCs. 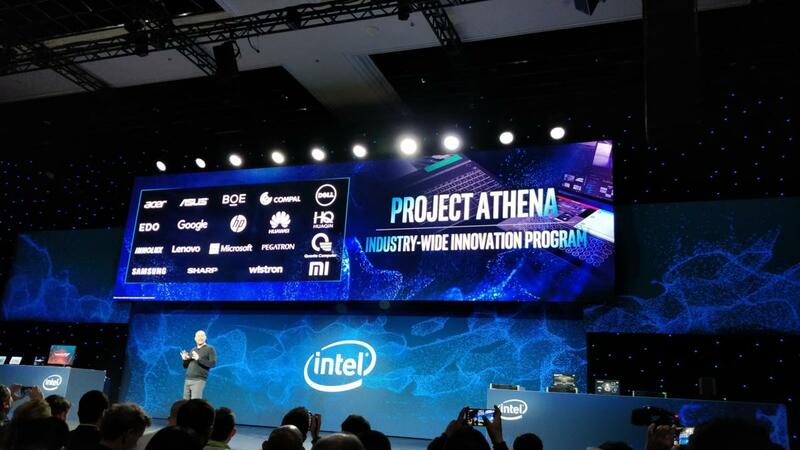 Intel’s goal with Project Athena is to work with the rest of the PC industry on the ultra-thin PCs that will launch with its Ice Lake CPUs at the end of 2019 to make sure they meet certain goals. Project Athena is an industry-wide effort to basically get more Windows machines up to Apple's standards. Project Athena laptops are expected to have long battery life with “real world” brightness settings of 200 to 300 nits, spring to life instantly when the lid opens, have fast and secure network connections (like Wi-Fi 6), include USB-C charging, and remain responsive even with lots of tasks going on at once. It’s a great effort to set the bar for Windows PCs, but it probably won’t have a lot of impact on MacBooks. Apple marches to the beat of its own drum, and does its own work on the platform level to optimize battery life, responsiveness, allow always-listening Siri, and it has already standardized around USB-C charging. Just as Intel’s original “Ultrabook” initiative was aimed at helping Windows PC vendors compete with the MacBook Air, Project Athena seems aimed at making sure a greater number of PCs are up to the standards of 2018’s Mac lineup. 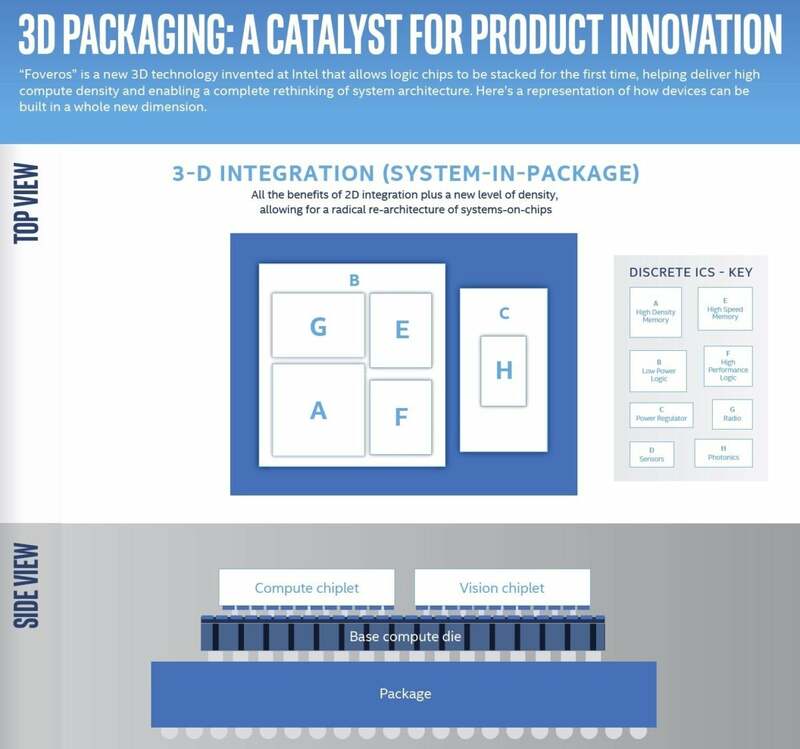 One of Intel’s more interesting recent announcements is a 3D chip-stacking technology it calls Foveros. It’s a manufacturing technology that allows Intel to stack low power chips, high power chips, and even RAM all on top of each other. It’s an interesting approach to getting various different chips to occupy minimal space, and could be really useful for producing smaller logic boards for laptops. 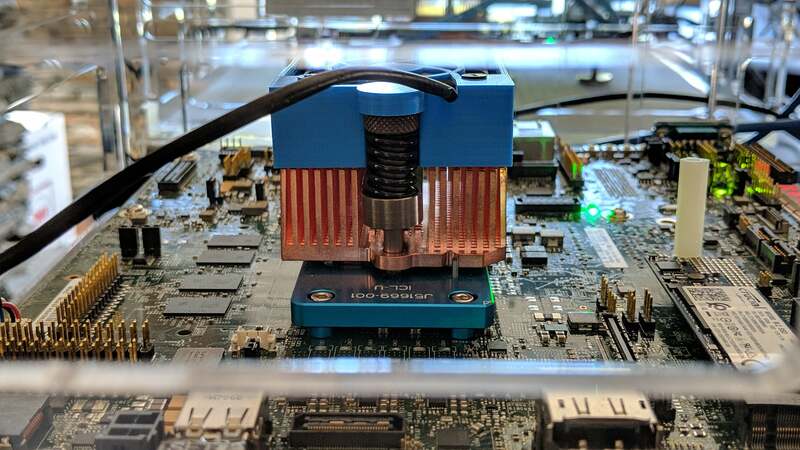 We’re not likely to see this on really high-power products, because it’s hard to cool a bunch of stacked high-end chips, but it’s just the thing for ultra-thin laptops. You could even stack high-power CPUs with low-power CPUs in an approach similar to mobile processors. Foveros is a chip-stacking technology that could save space in future laptops. Room for more battery! Intel has already produced a chip called “Lakefield” that stacks four small Atom CPUs on top of a big Sunny Cove CPU, and the company said it will be in production later this year. We may not see Lakefield in an Apple product, but the core concept is broadly applicable. Here’s the catch—Apple is starting to lean heavily on its own co-processors, like the T2 chip found in the iMac Pro or the new MacBook Air. That chip is made by TSMC, and it’s not really clear if Foveros is a technology that can stack Intel-made chips with non-Intel chips. When it comes to x86 chips, Intel has only one real competitor and that’s AMD. Until recently, it was safe to say that using Intel chips provides the best performance and power characteristics, but AMD’s Ryzen line is challenging all that. It’s possible, however unlikely, that Apple could use AMD’s chips in some of its products. The Ryzen Threadripper chips would be a perfect fit for the Mac Pro and iMac Pro, and if our early look at the third-generation products (due in the middle 2019) are any indication, AMD could definitely take the performance crown away. With such a long wait for Ice Lake and the Sunny Cove core, maybe Apple will decide to experiment with a new partner, particularly on high-end desktops? This story, "What Intel’s 2019 roadmap can tell us about the future of the Mac" was originally published by Macworld.